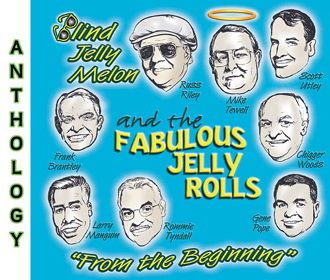 The Fabulous Jelly Rolls began their road to fame in the spring of 1996, when Russ Riley, a.k.a. Blind Jelly Melon, Chigger Woods, Frank Brantley, Rommie Tyndall, Mike Tewell, Gene Pope, Larry Mangum and Scott Utley came together to perform at local clubs and events in and around Durham, North Carolina. On a cold afternoon in 1999, the group got together and recorded their first efforts, one of which was Bring Your Own Money, a tune written by Russ, Frank and Scott. First performed in 1999, the acceptance of the song from the crowds led them to record the number for Ripete Records for the compilation, Life's A Beach Volume 2. Over the years, the Jellyrolls recorded ten more songs as a part of various compilations. Fast forwarding the clock fifteen years, The Jelly Rolls introduce their first full album, Blind Jelly Melon And The Fabulous Jellyrolls...From The Beginning. The album includes all of their previously recorded material, including the previously unreleased song from the first recording session, Don't Make Me Beg. The album features a typical Jellyroll-type song, You Never Had It So Good. Scottie Utley, who sings with the Group from time to time, shares the lead vocals with Russ Riley. Russ Riley along with Frank Brantley wrote many of the early songs with Russ writing all the new ones. Another one to pay close attention to is Mini-Foo-Foo, which has a "Blues Brothers" flavor to it. Other new songs included Little Things, a slow one with a country flavor, a Gospel number, Leavin' It Up To You and the comical song, Red Neck In A Beach Music Band. Durwood Martin formally of The Embers plays the piano for all of the new songs. Of the other previously recorded numbers, From The Beginning carries Don't Get Between A Dog And His Meat from the 2001 album, A Tribute To Fat Harold, Like The Rain from 2003's Beach Party 2, A shagger's Favorite, RitaMae with Gary Bass and The Jellyrolls from 2005's If Tens Gonna Kill Me Give Me Nine, Lie To Me from 2006's Locals Only 2, Suffer With The Blues, written and lead vocals by Scott Utley, from 2007's Forever Summer, Red Shagging Shoes from the album Get Ready For Showtime and I Wanna Win from Tobacco Road's Carolina Soul Collection. Also on the album is the Jellyroll's recording of Rudolph The Red Nose Reindeer from KHP's Ocean Drive Christmas Volume 2, recorded in 2007 and Rock This House from the Old School Shag album, recorded in 2008. Blind Jelly Melon And The Fabulous Jellyrolls From The Beginning was produced under the direction of Chigger Woods, Frank Brantley and Russ Riley with special assistance from Julian Fowler and Chris Jennings, guitarist for The Fantastic Shakers. The album was mixed, mastered and edited by Keith Houston of KHP Music.